The excellent people over at Text Publishing have put together a few books of John's work in time for Christmas. Pleasure to Be Here: Drawn from the 'Clarke and Dawe' weekly broadcasts, these timelessly funny scripts will delight readers as they revisit the scandals and stuff-ups of our lifetimes. Politics was never so preposterous. All the old favourites are here: Bob Hawke, Margaret Thatcher, Bob Collins (‘the front fell off’), Paul Keating, Alan Bond, John Howard, Kevin Rudd, Julia Gillard, Tony Abbott and Malcolm Turnbull. Tinkering tells the story of John Clarke’s writing life, including the fan letter he sent to All Black Terry Lineen when he was ten, a golf instruction manual unlike any other, Anna Karenina in forty-three words, and the moving essays he wrote after the deaths of his parents. Tinkering is full of surprises, and includes all kinds of puzzles and propositions. Each one has different rules but together they reveal the different facets of John Clarke’s comic genius. In these pages you will find Fred Dagg dispensing advice on everything from dentistry to dreaming, the complete history of the lost sport of farnakeling, the famous ‘Quiz Answers’, and ‘Saint Paul’s Letter to the Electorates’ —a brilliant account of the Rudd–Gillard years that was first inscribed onto stone tablets. You can now buy both the books in our shop. Here is the link to the event at the Melbourne Town Hall celebrating the life and work of John Clarke. The audio is provided free with donations welcome to Trust for Nature and Forest and Bird. Many thanks to everybody involved. On July 2, 2017 at the Melbourne Town Hall, the Wheeler Centre, with the support of the City of Melbourne and Film Victoria, and in collaboration with the Clarke family, presented ‘John Clarke: A Celebration’ - an evening of readings, stories, and music celebrating the life and work of satirist John Clarke. People have been asking a few questions about the evening. People have asked if there is anything they can do as a gesture in John’s honour. The Clarke family would like to encourage those who can make a charitable contribution in John’s memory to donate (in Australia) to Trust for Nature and (in New Zealand) to Forest and Bird. (Note: you can actually donate to either charity from anywhere in the world). People have asked if the celebration event is going to be broadcast anywhere. The answer is yes, it will be broadcast in part on radio and later in podcast form. This Friday 7 July, ABC 774 Melbourne will play an hour long highlights package in place of The Conversation Hour at 11am. There will be one other ABC broadcast at a later date and The Wheeler Centre will most likely be releasing a longer-form podcast in due course. We will keep people informed of this on the Clarke and Dawe Facebook page and the Mrjohnclarke Twitter account. The Clarke family would like to encourage those who wish to make a charitable contribution in John’s memory to donate (in Australia) to Trust for Nature and (in New Zealand) to Forest and Bird. John’s family, Helen, Lucia, Lorin, Anna, Alice and Stewart wish to thank the team at the Wheeler Centre for their tireless work putting this evening’s event together. Thank you to Jeremy Smith, who coordinated the live music. Thank you to tonight’s performers, to family and friends in attendance, and especially to John’s loyal audience. Thanks to the City of Melbourne, Film Victoria and the ABC for their support, and to Stewart Farrell and Kat McGuffie for their advice. Tonight’s choir, Melbourne Indie Voices, is an indie-folk choir run out of Fitzroy/Collingwood, directed by Sophia Exiner (Phia). You can find them here. A few words on John. Thank you, and a bit about tonight’s show. An excerpt from ‘Quiz Answers’, a series printed in The Age and on John’s website. On working with John Clarke. On working with John as an editor. Ended with John reading from The Even More Complete Book of Australian Verse (CD). Reading from John’s latest collection of little stories, ‘Commonplace’, in Meanjin. Reading from John’s book, The Tournament. Reading her own poem, ‘John John Morrison Morrison’, heavily influenced by A. A. Milne, whom John believed to be heavily influenced by Australia poet RACV Milne (whose work, discovered by John, is here). On John and golf, frisbee, diving, and Shane’s cameo role in Stiff and The Brush Off. Reading Part III of Auden’s ‘In Memory of W.B. Yeats’. Singing Meet Me in the Middle of the Air, by Paul Kelly. Reading Anthony Cronin’s ‘For a Father’. Reading ‘Frustration’ and ‘Comment’ by Dorothy Parker. Reading ‘A Child’s Christmas in Warrnambool’ from John’s book, The Even More Complete Book of Australian Verse. Reading extracts from Flann O’Brien's column in The Irish Times. On bird-watching. Ended with Callimachus's poem, 'Heraclitus'. On emailing, including a version of this story about driving delivery vans in London. On reading a poem together. On John and sport, and Wednesdays at the ABC. The sporting documentary project Amanda and John worked on together was Sporting Nation. On John’s passion for music. Reading A. D. Hope’s ‘Death of a Bird’. Maurice Ravel’s Sonata for Violin and Cello (1920-22) II Très vif. Reading ‘The Resolution of Conflict (concerning the Federated Under Tens’ Association and The Massed Five Year Olds)’ from John’s book, A Complete Dagg. On John in New Zealand and London. A tribute to Clarke and Dawe. Reading Gerard Manley Hopkins's 'The Windhover'. On John being an outsider. Reading Michael Leunig’s cartoon in honour of John. Told a story about John going body surfing. I first met John Clarke as an extra on a film I wrote with Bruce Beresford called The Adventures of Barry McKenzie. Although he had a silent role, he was instantly recognisable as a funny man and he just got funnier. He was a New Zealander with a strong Kiwi accent and his early creation, the character of Fred Dagg was as disrespectful of certain New Zealand men as Barry McKenzie of the Australian character. As I suspected early on he achieved national fame along with Garry McDonald and became one of the best and most durable Australian comedians or comedians anywhere. When Sydney hosted the Olympic Games, he created a television series called The Games which was the funniest television program ever made in Australia, as well as the most brutally honest depiction of local bureaucracy. I have not seen him in several years and I was very shocked to learn of his death. His humour seems to owe nothing to anybody, it was his own, totally original, devastating and yet kindly. 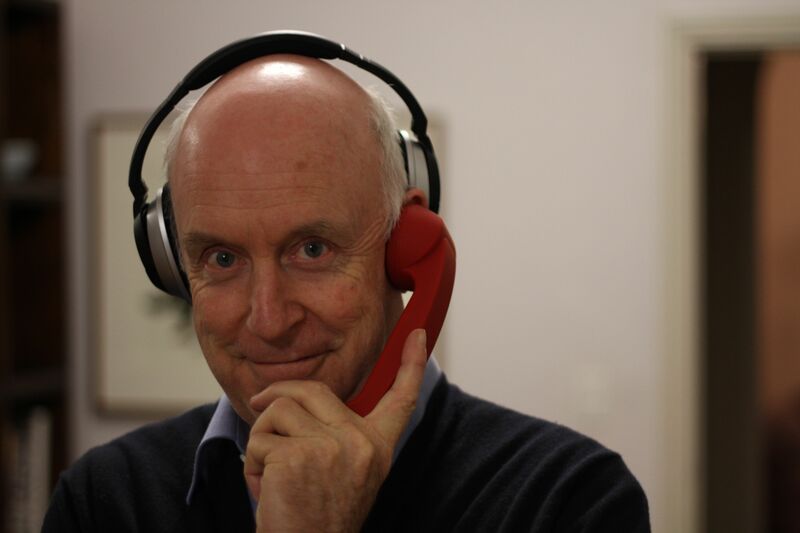 The nation needed John Clarke and we will miss him. For overseas viewers and those who missed out, here is the ABC's tribute to John. With thanks to the team who put it together. Enjoy. John has a run at the very back of the summer edition of 'Meanjin' and his guest appearance as a presenter on ABC Classic FM is being repeated on December 31. We wish everyone a happy everything and we'll be back on air in 2017.